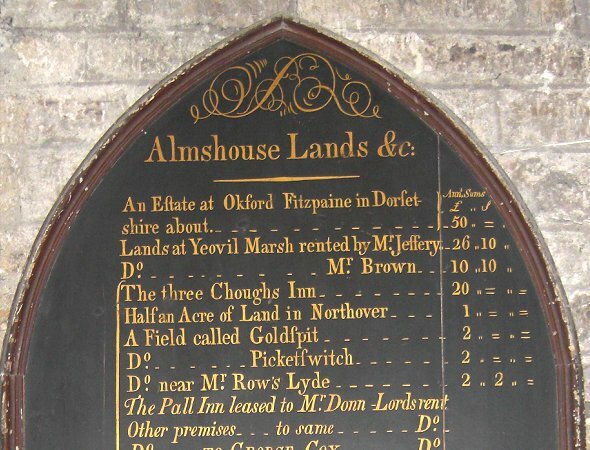 A pall, or mortcloth, is a cloth which covers a coffin at funerals and for many years the sign of the Pall Tavern (marked 'A' on the 1886 map below left) was based on an elaborate pall owned by the Woborn Almshouse that was hired out for such occasions (the Pall's mortcloth sign is illustrated at left). 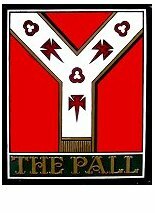 The Pall Tavern, properly, should be pronounced The 'Paul' Tavern. In fact the original Woborn Almshouse, founded in 1477, was sited just behind the property that was to become the inn, the site is occupied now by an Indian restaurant. The Pall Tavern in Silver Street (as well as the Three Choughs Hotel and the George Inn) was for centuries owned by the Woborn Almshouse and the rent of the building provided income for the Almshouse. The medieval almshouse had become so ruinous by the 1850’s that the new Woborn Almshouse was built in 1860 at its present site on the junction of South Street and Bond Street. 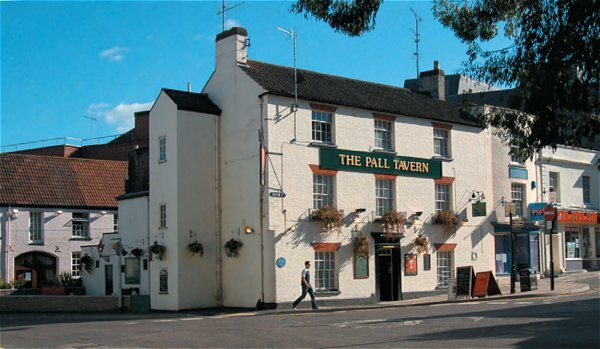 It is not really clear when the Pall Tavern first opened its doors - the current building only dates from 1836, but its predecessor had been trading for many generations. The first record in which the Pall is mentioned as an inn as opposed to a private dwelling, is in a lease dated 1769 - see Documentation below - in which it was claimed to be 'in very ruinous condition'. In 1796, the Woborn Almshouse account book lists Mrs Kitson as paying 16/- rent for the George in Middle Street, another Almshouse property, while she was already renting the Pall. In 1837 a day coach, called the Victoria, left the Pall Tavern three times a week for Salisbury - a journey that took seven hours. Silver Street at that time was a dirty, dingy and very narrow street with small lean-to cottages built against the churchyard walls opposite and the Pall Tavern itself was several feet closer to the road. At this time there was no sewage system in Yeovil and it is recorded that five-feet deep open ditches, euphemistically called 'sewers', ran alongside most streets, including an open drain that ran from the Pall Tavern to the town gasworks. This open sewer was still extant in 1849 when a Government report commented that Yeovil was "a very filthy, a very dirty and a very stinking place". Also just outside the Pall Tavern, where Silver Street and Market Street met, was a pond called the Horse Pool where the town's ducking stool had been sited. The Horse Pool was fed by a small stream called the Rackle - hence Rackleford or Reckleford, the ford across the Rackle. In fact Market Street, in a document dated 1355, is referred to as Ford Street although by the time Pall Tavern was operating Market Street was called Reckleford (and colloquially known as Rotten Row), while the modern Reckleford was known as Reckleford Hill and Lower Reckleford. Confusing enough? The Horse Pool was finally covered in during the early 1850's - see Documentation below. The Kings Arms Inn, four doors away, had also stood for many years in Silver Street but a major fire in 1835 destroyed it along with several other premises. 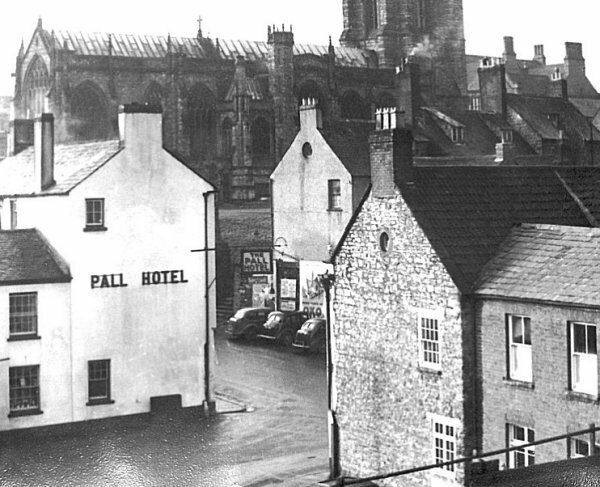 Following the fire all the premises from the Kings Arms to and including the Pall (shown in the photograph below) were rebuilt further back from the road so that Silver Street could be widened thereby easing congestion in the centre of the town. Looking at the photograph below it makes you wonder how narrow Silver Street must have been before 1835, bearing in mind that at that until about 1816 there were also small houses built up against the church boundary wall at right, seen just beyond the cars at right in the photo below. The Pall was rebuilt in 1836 and the old materials were sold off for £22.10s. At left is an undated but probably late Victorian public house 'check' or trade token issued at the Pall Hotel. It is made of brass, is 25mm in diameter and has a milled edge. The reverse is plain but on the obverse it says "PALL HOTEL, YEOVIL" and its value - 2D. At this time two old pence could buy you a pint of stout. Checks were frequently used in games, such as skittles or quoits where, for instance, players would 'chip in' a check to the 'kitty' which would be won by the winning team to redeem at the bar. By issuing checks a landlord could guarantee they would be spent in his establishment only. It is interesting to note that, in its advertising, the Pall offered good stabling, with horses and traps let for hire. In 1879 Thomas Luxton was advertising "A Commodious Tent with all Appliances to be Let on Hire" and by 1899 the Pall was boasting a 'good bowling alley'. The Ministry of Town & Country Planning's Provisional List of Buildings of Architectural or Historic Interest of July 1948 described the building and its neighbours thus - "Silver Street bounds churchyard on east side. Houses on one side only, facing church. The houses themselves are mostly 18th or early 19th century in date. They are not of great merit individually but they retain their Georgian scale and form part of the pleasant surroundings of St John's church. They are therefore of value in a largely modern town. Grade III. No 15 (Pall Hotel) - Three-storey three-window painted brick front. Tablet on corner is inscribed 'Rebuilt 1836'. Sash windows. Simple late Georgian door case with wire guard above cornice to take flower-box. Wrought-iron bracket carrying sign projects from angle of house." The following description is taken from the Somerset Historic Environment Record - "Inn, rebuilt in 1856 (sic), possibly using some earlier material. Brick, colourwashed, with double Roman clay tile roof 3-storeys in a plain Georgian style of 3-wide bays. Central 6-panel entrance door with simple stone surround and flat hood, 16-pane sash windows on either side in plain openings with flat gauged brick arches over: three 16-pane windows to first floor, three 12 pane-windows to second floor: all windows fitted with modern false shutters. Plain verges to gables, brick stacks each end. To north (Market Street) side a modern 3-storey extension of middle C20. Interior much altered at ground floor level, remainder not inspected. Inn sign on North West corner wrought iron bracket of interest. Attached to rear the stables, probably also an 1856 rebuild. Large 2-storey brick building, colourwashed on front with double Roman clay tiles, the North gable having a coping, there being a brick stack at the opposite end. Originally 6-bays (only 4 now visible). 16-pane sash windows to both floors, except bay 2 ground floor which has large chamfered brick arch with modern infill: above is a 15-pane glazed door. The sundry links and extensions of little interest. Interior not inspected." For a list of tenants paying rent to the Woborn Almshouse click here. 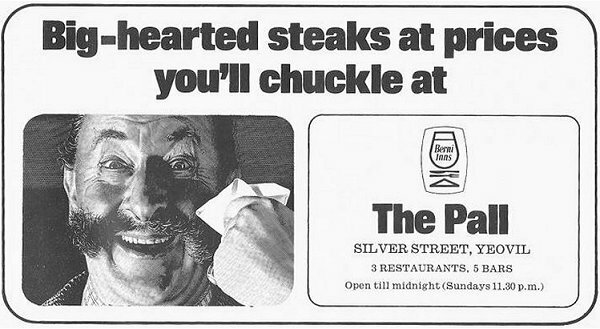 Thanks to Mike Hine for the following memories - "The Pall was, in the early 1960s pre-Berni, a 'squaddie pub'. I don't know who was stationed at Houndstone camp but a large number seemed to be Scots. It was also thought to be a 'brothel'." (His words, not mine - the only Yeovil brothel I know of (from paper research, not practical research, you understand) was run by Ellen Sheppard at 16 South Western Terrace - she later ran the Fleur-de-Lys in High Street, see which for further details). And from me - "Hands up those of you who remember the Pall as the Berni Inn in the 1970's and early 1980's with its three restaurants and five bars. Those were the days - we used to eat here with great regularity. Check out the ad at the very bottom of the page. Still one of the few Yeovil pubs selling decent ales and always features in our regular Gentlemen's Cultural Walking Refreshment Tours of Yeovil (i.e. crawls)". Of the licensees of the 'modern' era George Harris who was licensee in 1839 and 1840 couldn't be traced because there was more than one man of that name in Yeovil at the time although he may have been the George Harris who lived in Belmont Street in 1841 and was father of John Harris who ran a beerhouse there. Thomas Lukins was born in Allowenshay, about 12 miles west of Yeovil, around 1793. He was first listed as the licensee of the Pall in the Land Tax Returns of 1828 (and possibly in the Quarter Sessions Deposits of the previous year). He was listed as a landowner in Silver Street in the Poll Books of 1832, 1833 and again in 1846. He is listed as a Silver Street innkeeper (although the pub is not named) in the 1841 census, at which time he was aged 50 and living with his wife, Susan. In the 1851 census he and Susan were still at the Pall where his occupation was given as innkeeper (while another Thomas Lukings was licensee at the Hollands Inn). Lukins was landlord of the Pall for some twenty years until 29 September 1839. In 1841 Edmund Henning, brewer of Hendford, took the inn over (at £50 per annum payable to the Trustees of the Woborn Almshouse) and placed Lukins in the Pall to sell beer for him on commission. In 1847 Thomas Lukins was declared bankrupt. Thomas died in 1855, aged about 62 and Susan assumed the license of the Pall briefly. She was listed as Mrs Lukins in Harrison, Harrod & Co's trade directory of 1859 but she died in the spring of 1859 aged about 71. Yeovil-born Sophia Allen appeared briefly as the licensee of the Pall Inn in the 1861 census in which she was listed as the innkeeper. At this time she was aged 29 and although listed as married her husband was absent on the night of the census but her two children, one-year old Kate and baby Robert were listed as was her sister-in-law, Lucy, and three servants. I couldn't trace her after this date. Francis William Harrold was born in Castle Cary on 7 October 1836 the son of publican Francis William Harrold senior and his wife, Charlotte. In the 1841 census Francis was living with his parents and siblings in a Castle Cary pub but during the next ten years his father died and in the 1851 census his mother was running the pub. At this time Francis was 14. Francis married Eliza Taylor on 19 May 1868 and by the time of the 1871 census he and Eliza had moved to Yeovil where the census listed him as the hotel keeper of the Pall Hotel. Living with them was 6-month old baby son, Francis, a barmaid, waitress, housemaid and an ostler. By 1875 the family had moved on from the Pall Hotel and by 1881 they were back in Castle Cary, living in the High Street Post Office where Francis, employed as an auctionéer and postmaster, was with Eliza, Francis junior and three young daughters. Thomas Luxton was born around 1830 in Cullompton, Devon. 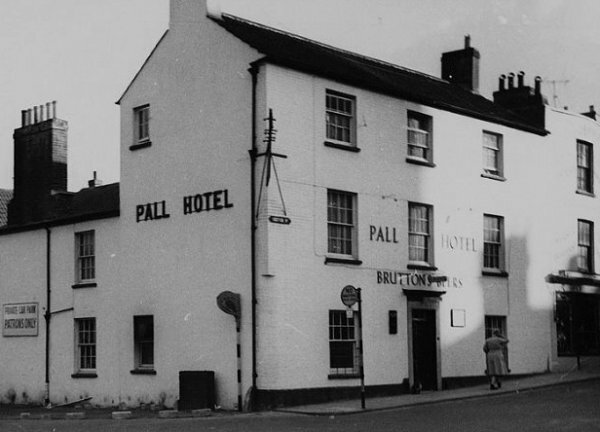 In 1871 he was licensee of the village pub in Aylesbeare, Devon but by 1875 had moved to Yeovil and was listed in the Post Office Directory as licensee of the Pall Hotel. In 1881 he was listed as the licensee at the King's Arms (3) with his wife, Anne, and son Thomas who was listed as an innkeeper's assistant. There are no further records of the Luxtons after 1882. The next licensee, Robert Leach, was born in Yeovil in June 1847 the son of pastry cook Henry Leach and his wife, Louisa. In 1851 the family lived in Belmont, next door to the Britannia Inn. He married Ellen in 1873 but he turned out to be one of those roving publicans who seems to move from pub to pub - he was licensee of the George Inn in Middle Street in 1878, licensee of the Pall Tavern with his wife, Ellen, in 1881 and licensee of the Half Moon by 1889. In January 1885 the Western Gazette, in reporting the proceedings of the Petty Sessions noted that he was fined 15 shillings including costs for a breach of the Licensing Act by selling ale out of hours. Ellen died in December 1892 and Robert married his second wife, Sarah, during the mid 1890's. However Robert died in the spring of 1897 and Sarah became licensee of the Half Moon where she was to remain until her death, at the age of 64, twenty five years later in the winter of 1922. Robert Allen was born about 1824 in Sherborne, Dorset, the son of painter Richard Allen and his wife, Sarah. In the 1841 census 15-year old Robert's occupation was given as a painter's apprentice and ten years later, still living at home with his parents and eleven siblings, he was listed as a painter. By the time of the 1861 census Robert had married Matilda Catherine Buller, had a son, Robert junior, had moved to Yeovil and had become licensee of the Greyhound where the census listed him as a victualler with Matilda, their son and her mother living on the premises along with three servants (a house servant, an ostler and a nurse maid) and two lodgers. In the 1871 census the only differences were three additional children and only one servant and Robert's occupation was listed as innkeeper. By 1881 Robert and his family had moved around the corner and were living in Union Street. Robert's occupation was now the manager of a soda water manufactory, and still was ten years later. (The Mineral & Soda Water Works were located in Union Street, opposite what used to be the front entrance to the police station) although in 1889 he was listed in Kelly's Directory as the licensee of the Pall Hotel. Robert died in September 1900. Edwin Mold was born about 1844 at Fisherton, near Salisbury, Wiltshire, the son of a journeyman sawyer, Thomas Mould, and his wife Elizabeth. In the 1851 census Edwin was living in Back Lane, Fisherton with his parents and seven siblings but by 1871 Edwin was employed as a porter in the City Hotel, Bristol, where he was one of 29 live-in employees! By 1881 he had married and was living in Wellington Street, Yeovil with his wife, Eliza, two sons and a daughter. He was employed as a hotel boots. In the 1891 census Edwin was listed as a publican at the Pall Hotel and advertised himself in Whitby's Yeovil Almanack Advertiser of 1901 as Advertised himself "late Boots of the Choughs Hotel". He and Eliza lived in the Pall with four of their children. Edwin was listed as the licensee of the Pall in Kelly's 1895 Directory and in the same year the Western Gazette Almanac listed HW Pearce as the proprietor of the Pall Hotel and the following year Whitby's listed Charles Stott as proprietor. 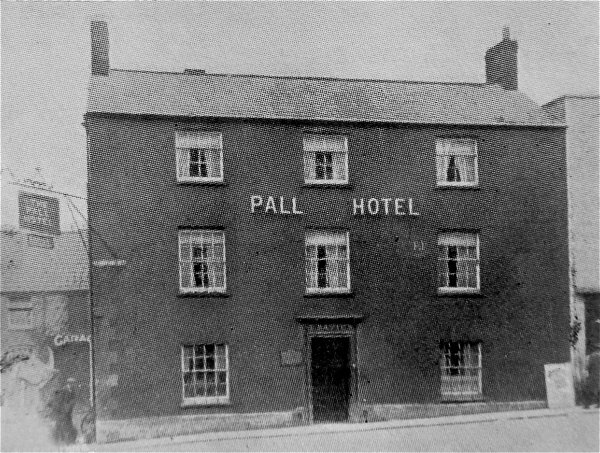 Edwin died in 1895 (possibly in Honiton, Devon) and Eliza was listed as licensee of the Pall Hotel from 1897 until 1903. She died in 1929 aged about 85. 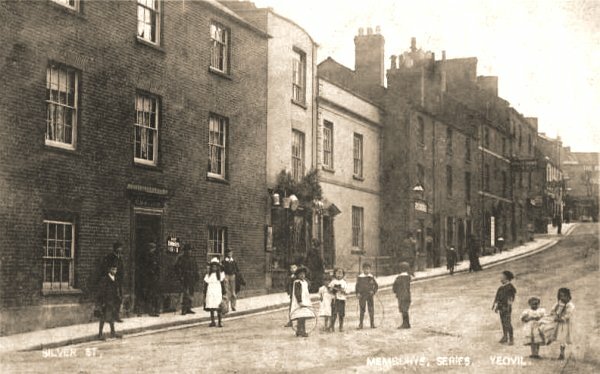 Ellen Davies was born about 1854 in Yeovil and was listed in the 1907 Yeovil Directory as the new licensee of the Pall Hotel. In the 1911 census she was a 57-year old widow and had had nine children, three of whom had died. She had been married at least twice because living with her at the Pall were her two unmarried sons, Charles aged 36 and William aged 34, who both had the surname Powell and were both born in Monmouthshire, Wales. Her two daughters, Gwen aged 22 and Elizabeth aged 21, were also born in Monmouthshire. Both daughter were unmarried and both had the surname Davies, indicating they were from Ellen's second marriage. Ellen was frequently listed in various trade directories up until 1919 after which Elizabeth assumed the license of the Pall until at least 1939. Ellen died in Yeovil in December 1927 aged about 73. 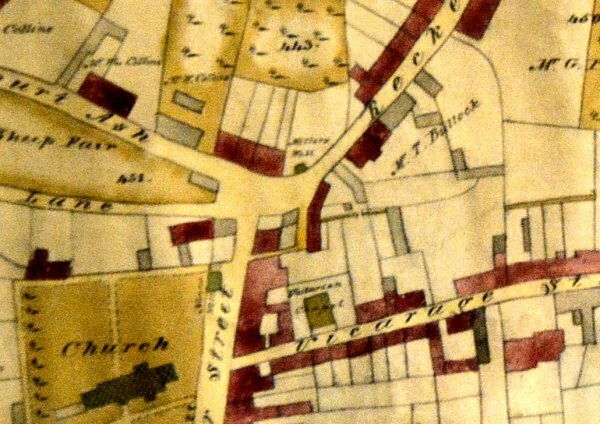 E Watt's map of Yeovil of 1806 showing the junction of Sheep Lane / Court Ash / Reckleford / Silver Street (today's North Lane / Court Ash / Market Street / Silver Street). At centre, is the original Pall Tavern (before it was rebuilt in 1836) with a narrow alley running alongside leading to the original Woborn Almshouse that also faces Miller's Well at its northern end. One of the four Charity Boards on the wall of St John's bell tower. Listing all the lands the Woborn Almshouse owned in 1804, including the "Pall Inn leased to Mr Donn". At high level on the corner of the Pall building this partly painted-out notice gives the date of the rebuild. Obviously no photographs exist of the first Pall building seen in the 1806 map above. 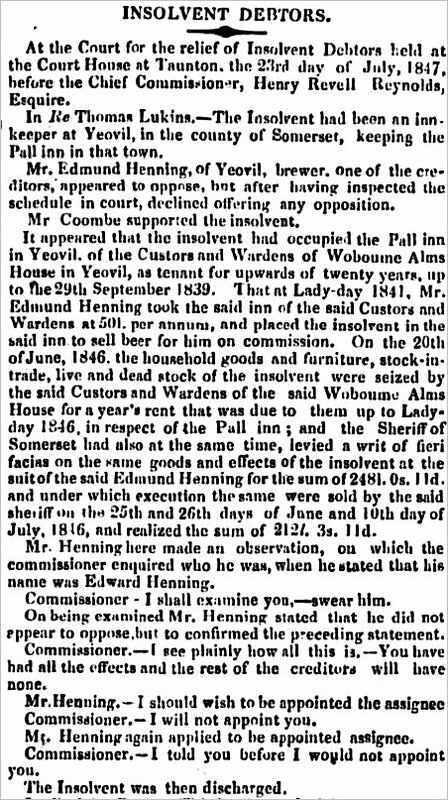 The report on the insolvency of Thomas Lukins and the involvement of Edmund Henning in the running of the Pall, from the 28 July 1847 edition of the Taunton Courier. 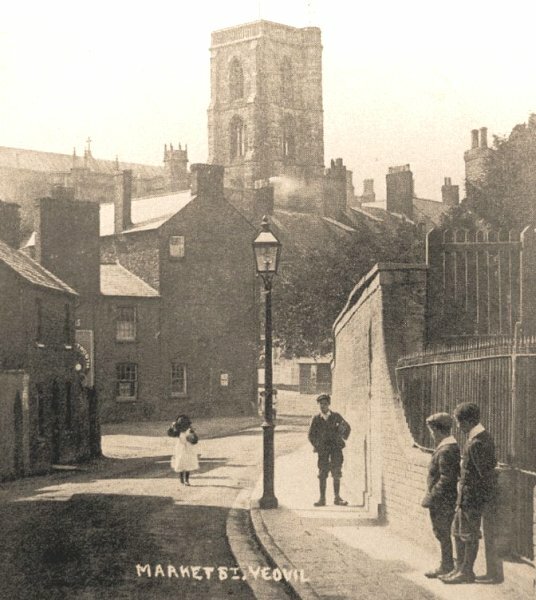 A sepia-toned photograph dating to 1905 looking along Market Street towards the Pall Inn, to the left of the streetlight, dominated by the tower of St John's church. The Silver Street elevation of the Pall in a photograph taken in the early 1930s. The Pall's yard, again in a photograph taken in the early 1930s. The side wall of the Pall itself is at extreme right with 'Beecham' written on it at high level. The main building of this photograph is now an Indian restaurant. The Pall Hotel seen from the north and photographed during the 1950's. Note that the end wall is plain and lacks the three-storey fire escape extension as seen in the last photograph here. 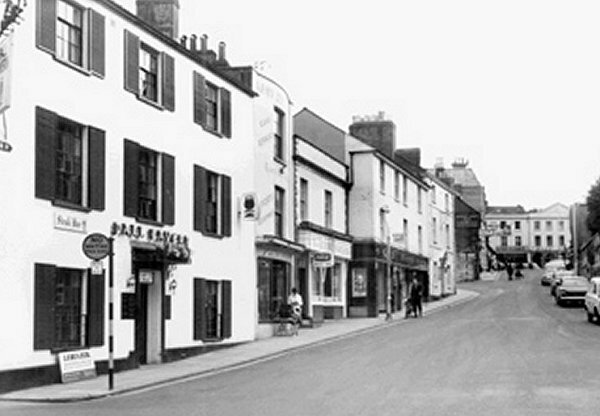 So, there's the Pall Tavern and the run of shops up to the King's Arms (the last white building) in this photograph from the 1960's. 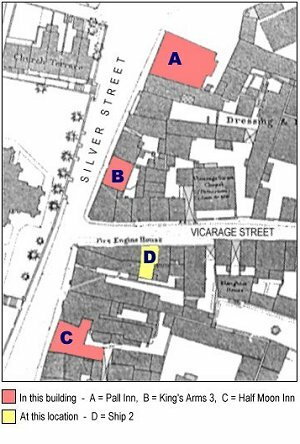 Now imagine the whole lot moved some six feet or more into the road while opposite, where the cars are, is a row of small houses - you've now got some idea of how narrow Silver Street was in the 1830's. What's more, the photographer would probably have been knee deep in the Rackle stream. 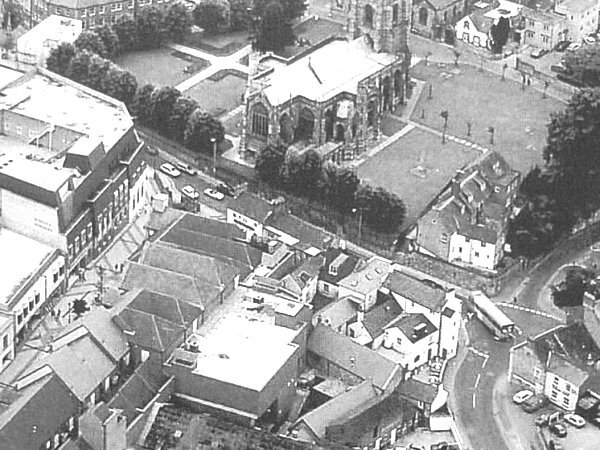 In an aerial photograph of 1988 dominated by St John's church at the top and new Quedam Centre shops at left, the Pall Inn is towards the lower right with the bus passing it. Also visible is the rear of the Kings Arms 3, just to lower right of the three white cars by the church. 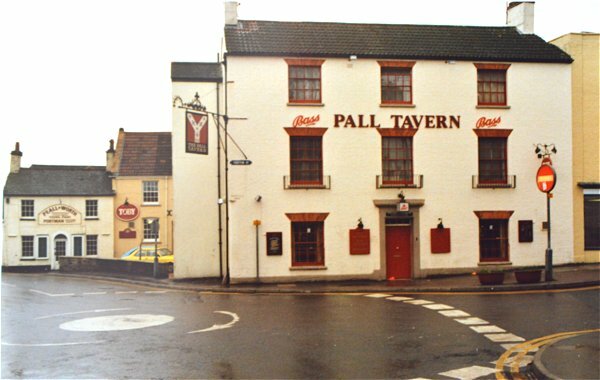 The Pall Tavern photographed in 1989. 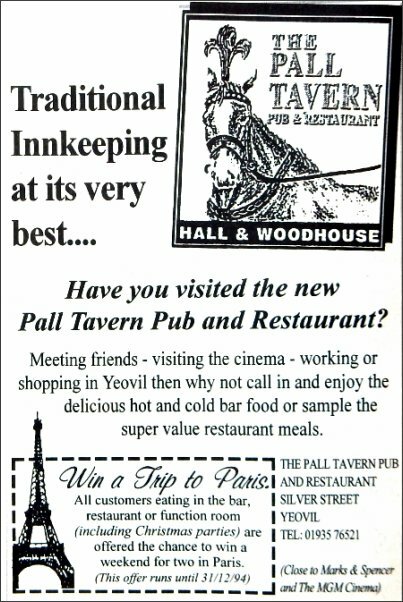 Advertisement for the Pall Tavern from the Visitor, November 1994. 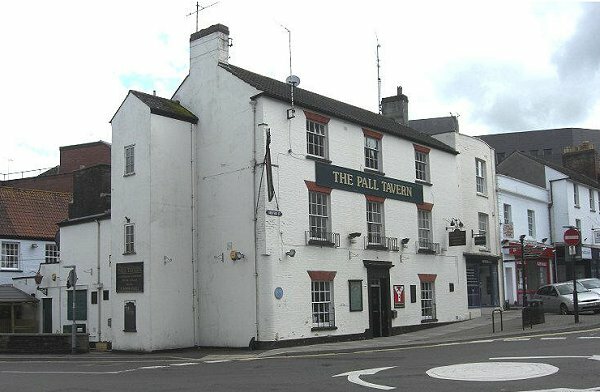 The Pall Tavern, photographed in 2005. The Pall Tavern in 2012 - still selling decent ale with three pumps on. The site of the Horse Pool was to the side of the Pall, where the small wall at the very left of the photograph now stands. 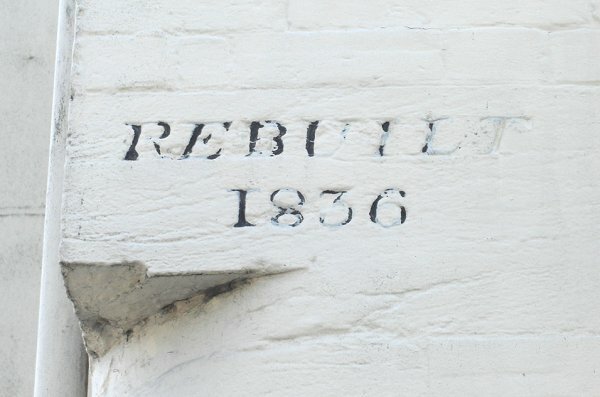 1836 - Rebuilt, old material sold for £22.10s. Note - much of the early documentation concerns the building that was later to become the Pall Tavern, the Horse Pool, a building called the Dye House and the Woborn Almshouse - all seen in the sketch map at top of this page. 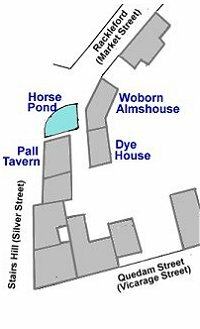 The Horse Pool was to the immediate north of the Pall Tavern, the Dye House was immediately behind the Pall Tavern and the Woborn Almshouse was attached to the north of the Dye House and to the immediate east of the Horse Pool. 22 June 1835 - It was resolved that the Town Commissioners shall be allowed to throw into the Street a part of the front of The Pall Inn described in a Plan prescribed this day by Mr Joel Hardy measuring 34ft 10insin length from North to South & 2 feet in width at the Southern and not less than one foot nor more than fifteen inches at the Northern extremity thereof. And that the Master of the Almshouse shall be allowed to take into the new Building about to be erected at the Pall Inn such part of the Horse Pond as they may require for bringing the said new Building square and that The Town Commissioners shall pay to the Master of the Almshouse for such land as they may take over & above what they may give at the rate of 1s. for each foot superficial measure this arrangement being considered mutually beneficial to each Trust and particularly to the Almshouse. N.B. - Rebuilding of Pall Inn - Ham Hill and Keinton stone used - Builder, Harvey. Skylight for Mr Duffett's. - Total cost about £1,000 including redecoration and pump. 3 May 1836 - It appearing to the Commissioners that the ancient watering place in Rackleford adjoining the Pall Inn commonly called the Horse Pond is unnecessary and that same is an annoyance to the Inhabitants of that neighbourhood, and that it would be a material improvement to the Town if such Pond were done away with - It is ordered that the same be drained and filled up - And that in lieu thereof a sufficient tank or reservoir be made for supplying water in case of fire - And also a trough for watering horses with a lip or spout of sufficient height to allow the placing of a bucket or other vessel underneath, or a pump, or both, as hereafter may be thought most advisable for furnishing the Inhabitants with Water. Victoria day coach three times a week from Pall Inn to Salisbury - a seven hour journey. An ad from the 1970 Yeovil Official Guide Book. Aaaah... who remembers the Pall when it was a Berni Inn? with three restaurants and five bars - those were the days, we used to eat here very frequently.